Prism glass: the stained glass used in storefront windows historically found in commercial buildings on main street. The shimmering, textured surfaces of original prism glass transom windows — running the width of a historic storefront above the main display windows — can be a rare treat when they’re intact. Sometimes referred to as clerestory windows, traditional transom windows on main street were sometimes equipped with special prism glass: sheets of glass composed of small panels, each roughly 15 cm square, featuring a distinctive prismatic or wedge-like pattern cast into the interior-facing surface (see photograph below). Some panels also featured patterns cast into the outer face too. Assembled into panels using cames, or narrow bars of lead or zinc, prism glass transom windows were popular in pre-World War I commercial buildings when interior electric lighting was relatively weak and inefficient. With sunlight free and plentiful, especially in Alberta, the prismatic panels were oriented in such a way as to capture incoming light and refract or deflect it deep into the store within. A close-up of a piece of prism glass from the Renwick Building, a Provincial Historic Resource on Fort Macleod’s main street (Courtesy of Fraser Shaw, Historic Resources Management Branch). Given their relative rarity, the analogy to stained glass windows of churches and other buildings isn’t entirely out of place. Like stained glass, the glass itself is often coloured: manganese added during the manufacturing process to make the naturally green glass clearer often turned a purplish colour after decades of exposure to ultraviolet radiation in sunlight. (The colour also appears in some old telegraph line insulators and the now almost-vanished sidewalk “skylights” — which are a story of their own). You can spot prism glass in certain parts of Calgary and Edmonton and on some of Alberta’s historic main streets, although it is easily mistaken with so-called “reeded” glass, similar glass panels impressed with narrow ridges rather than the unique prismatic profile specially oriented to pull sunlight into store interiors. Sometimes only close inspection can distinguish the two. Why is prism glass so rare now? Like many features of historic buildings, particularly in the commercial district, these components were subject to changing fashion, retailing trends and, of course, the rigours of our climate. The benefit of prism glass and transom windows declined as electric lighting improved in efficiency and affordability, particularly with the mid-century introduction of fluorescent lighting. Prism glass transom windows were traditionally paired with retractable awnings, which allowed the store’s proprietor to regulate the amount of light coming into the store. As awnings went out of fashion and were removed, the transom windows often pulled in so much sunlight that stores were often too brightly lit, hot and stuffy. The unrelenting sunlight would also fade display items. 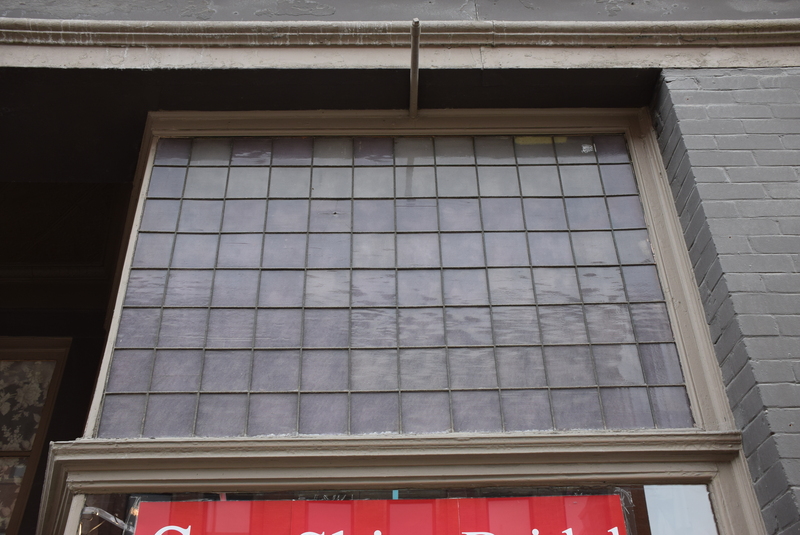 An original prism (or possibly reeded) glass transom window on the Bell Block, a large late commercial style building on Macleod Trail in Calgary (Courtesy of Fraser Shaw, Historic Resources Management Branch). Physical deterioration of course also played a part: decades of thermal expansion and contraction, exposure to moisture, and wind loading took its toll on the delicate assemblies, causing cames and soldered joints to fatigue or break, with the eventual result that many transom windows were removed or covered with painted plywood sheets. Changing retail fashion assisted the process: as automobile use increased throughout the twentieth century, so did the need for larger, illuminated signs. Prism glass and transom windows, having outlived their original purpose, were covered over or removed with “slip cover” remodeling of main street storefronts in the 1930s onward. Today, historic transom windows, and especially those of rare prism glass, are coveted historic building elements that many building owners want to restore. Sometimes intact original windows are preserved behind later materials; often, however, they need extensive repairs. Where that’s the case, there are excellent resources to assist in restoration. For information on conservation prism glass or other elements of a historic resource, contact your heritage conservation advisor. Written by: Fraser Shaw, Heritage Conservation Advisor. 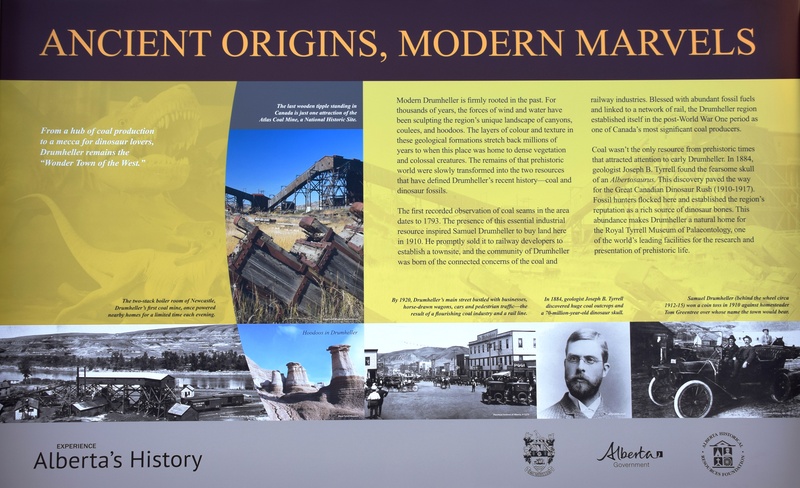 Visitors to the Town of Drumheller can now learn more about the history, geology and natural resources of the community with the installation of a new Alberta Historical Resources Foundation Heritage Marker. Combining text with contemporary and archival photographs, the marker describes how the forces of nature shaped the area’s striking landscape and left the region rich in the two resources that would define Drumheller’s future – coal and dinosaur fossils. The Drumheller Heritage Marker up-close (Courtesy of Stefan Cieslik, Historic Resources Management Branch). It was coal that first attracted the attention of railway and mining investors, who established a townsite to support the booming coal industry. By the end of World War One, the Drumheller region was one of Canada’s leading coal producers. The area also caught the imagination of fossil hunters, who flocked to the region from 1910 onward in search of fossils like the massive Albertosaurus skull unearthed by Joseph B. Tyrrell in 1884. The abundance of dinosaur bones made Drumheller a natural home for the Royal Tyrrell Museum of Palaeontology, one of the world’s leading facilities for the research and presentation of prehistoric life. The marker was installed on November 20, 2014, along Highway 9, one-and-a-half kilometers north of the Town of Drumheller. The Town of Drumheller applied for the development of the heritage marker through the Alberta Heritage Markers Program. The program was established in 1955 to promote greater awareness of the historic people, places, events and themes that have defined the character of our province. The program brings Alberta’s dynamic history alive through heritage markers placed at roadside pullouts, within parks and in other community locales. Written by: Allan Rowe, Historic Places Research Officer. Please refer to the links above to access the grant guidelines for each funding program. Questions regarding MHPP can be directed to Michael Thome, Acting Manager of Municipal Heritage Services at michael.thome@gov.ab.ca or 780-438-8508 and questions regarding HPPP can be directed to Carina Naranjilla, AHRF Grant Program Coordinator at carina.naranjilla@gov.ab.ca or 780-431-2305. Written by: Rebecca Goodenough, Municipal Heritage Services Officer. I came this close to writing this post in the third person. I then returned to my senses, and decided to just go for it and write a brief personal message here to you terrific RETROactive readers. 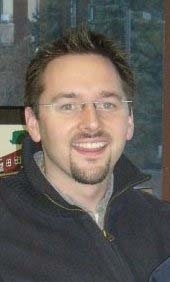 I’ll be moving on from my much-loved role of Manager, Municipal Heritage Services. In early February, I’ll be returning to my hometown of Chilliwack, B.C., where I’ll be serving as Executive Director of that historic community’s Museum and Archives. Spending more than 100 days ‘on the road’ in 2006, when we were launching the Municipal Heritage Partnership Program, conducting “MHPP Roadshows” in Edmonton, Fort McMurray, Grande Prairie, Red Deer, Calgary, Lethbridge, and Medicine Hat, as well as presenting to over 75 municipal councils! You don’t realize the sheer scale, breadth, and beauty of Alberta until you get out driving its highways and backroads. Most people don’t realize that a municipality like Mackenzie County or Wood Buffalo are larger than Switzerland! Launching the Municipal Heritage Forum as a “Summit for Stakeholders” in 2006. Back then, there were lots of people doing great local heritage conservation work across Alberta, but most of them didn’t know each other well. That first Forum, which we put on at the World Trade Centre in Edmonton – gave people a chance to get to know each other, and put a face to a name. After that, people doing heritage in Smoky Lake County or Yellowhead County felt free to call other people they had met, ask questions, and share what had worked for them. Since then the Forum has of course grown, and I am thrilled to see how delegates have really taken ownership of it and made it their own dynamic, learning community. We saw a new way forward for the Alberta Main Street Program, and built a flexible and sustainable paradigm of doing a fantastic program, that needed a new approach. Now, we have a tremendous, creative network of historic communities (Lethbridge, Olds, Old Strathcona, Camrose, and Wainwright), animating their heritage commercial districts with energy, conservation, and high-quality urbanism. I remember attending one Council meeting (at a municipality which shall remain nameless), where the delegation presenting before me was a zealous farmer who came in coveralls, straight from the harvest fields – and slammed a heavy rock down on the Council table – THUD! He was irate and relayed the story that the County staff must have knocked this rock into his field during Winter snow removal, as he insisted he “hadn’t had a rock like that in his field for three generations!” The rock had been kicked up and shattered the window of his combine. He requested compensation for half the cost of replacing the damaged window. I thought the man’s claim was reasonable. Before you knew it – there was a motion passed to provide the compensation. Now that’s democracy in action! (That same County did then proceed to do some tremendous heritage planning work over the next few years, legally protecting a number of its significant historic places through Municipal Historic Resources designation). We saw the number of designated Municipal Historic Resources (legally protected by local governments) grow exponentially, from under 70 in 2006 to well over 300 in 2015, with 240 already listed on the Alberta Register of Historic Places! Of all the memories of projects – from Pincher Creek down south to Fort Vermilion up north – I still have to say the greatest memories are the people. Working with local Heritage Advisory Boards was so enjoyable because the “why” is so compelling. The people who do it are there for a reason – they love their historic places! It was also great to work collaboratively with the municipal staff and heritage planners across the province. I know that I have learned a lot from their knowledge and experience – and there is still so much to learn! And, of course, I had the privilege of working as colleagues day in, day out with the best team of heritage professionals in Canada here at Historic Resources Management. Thanks – to all of you – for the memories! Let’s keep on creating a future for our historic places. Written by: Matthew Francis, former Manager, Municipal Heritage Services. 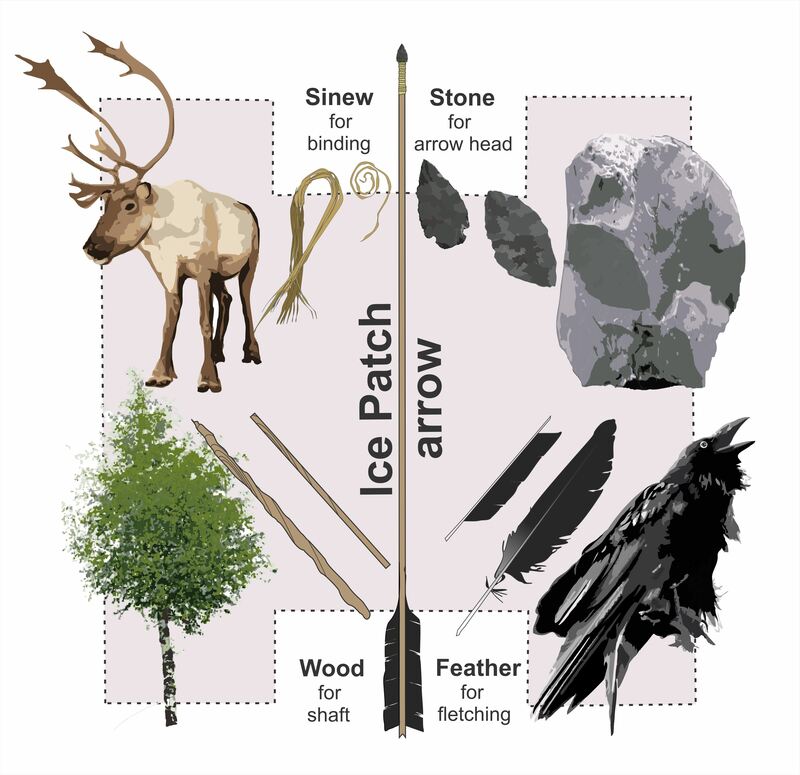 Recent archaeological research from Alaska to Yellowstone has revealed rare and delicate tools preserved in high altitude ice that tell of a deep human history in some of the most remote alpine habitats on the continent. These artifacts were lost by ancient hunters of alpine animals (like caribou and sheep) and had been encased in a barrier of ice that warming temperatures have recently unlocked. A race is now on to find frozen relics from the past before they, and the icy archives that house them, disappear. 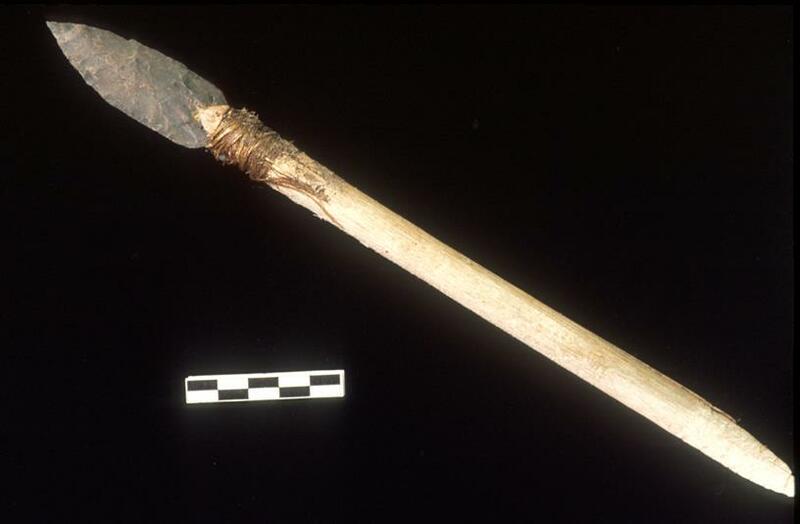 This stone dart is over 4000 years old and is preserved in its original wooden shaft (courtesy of the Government of Yukon). The story of prehistoric alpine hunters in North America owes its existence to Yukon biologists who discovered an odd piece of wood above the treeline. The find was reported to local archaeologists who realized that it was a wooden tool lost on the ice thousands of years ago. 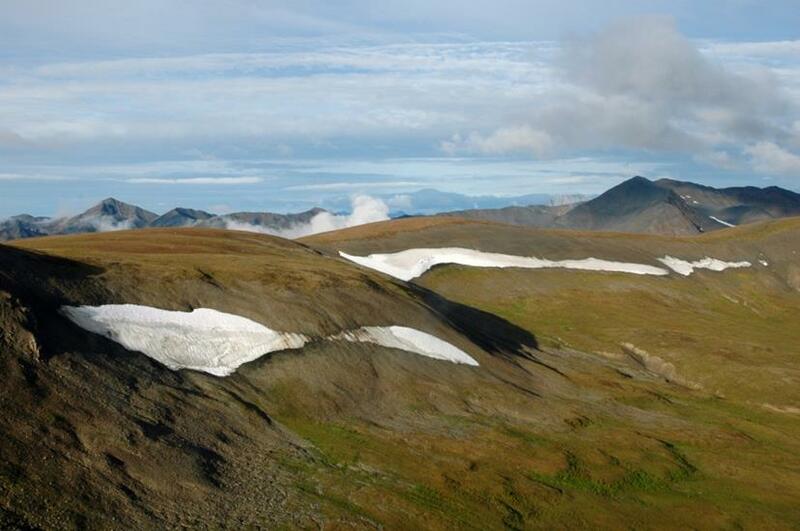 First Nations across the North still remember stories of traditional life in the alpine, but until that lucky Yukon find, archaeologists didn’t expect that much physical evidence of old activities could be preserved in the harsh high altitude conditions. It is very rare to find wooden tools that are thousands of years old, so the artifact triggered a series of research programs in the North. 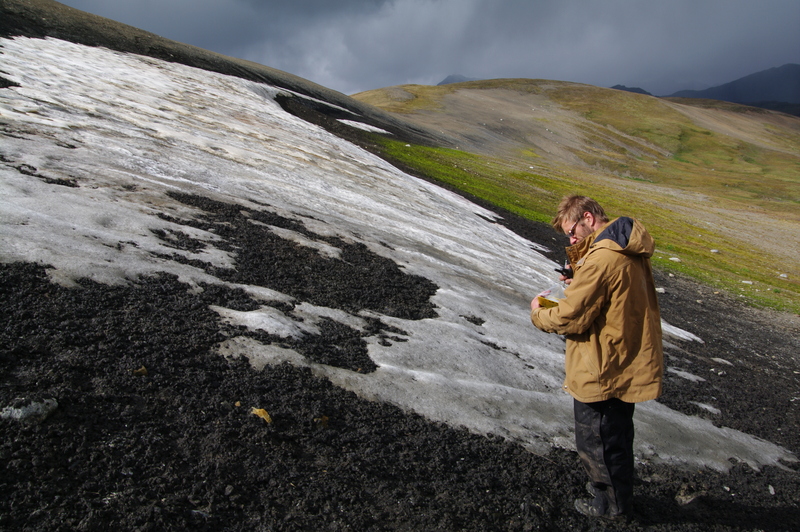 An archaeologist (Todd Kristensen) surveying a melting ice patch for artifacts (courtesy of Mike Donnelly). 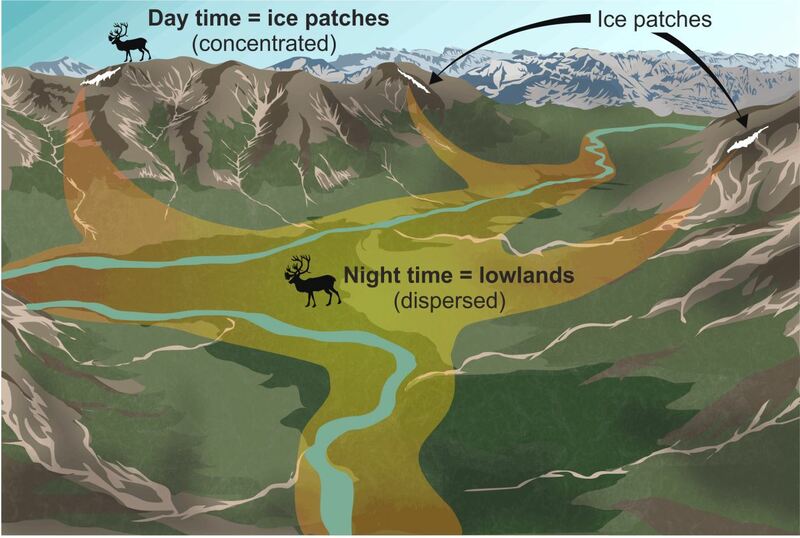 On a daily basis, caribou migrate upslope to colder heights during the hottest time of day only to return to the valleys at night. Alpine ice features provide animals relief from insects and hot temperatures. This long-lived habit of ice patch use makes these animals predictable. And so, as long as caribou and other animals have been gathering at ice patches in the North (for over 9000 years), people armed with sturdy moccasins and stone-tipped weapons have followed them. Caribou gather on the upland ice features to stay cool in the midday heat (Todd Kristensen). The perfect ice patch borders a round top that enabled hunters to lurk from above undetected (Todd Kristensen). This moccasin held the foot of an alpine climber over a thousand years ago (courtesy of the Government of Yukon). 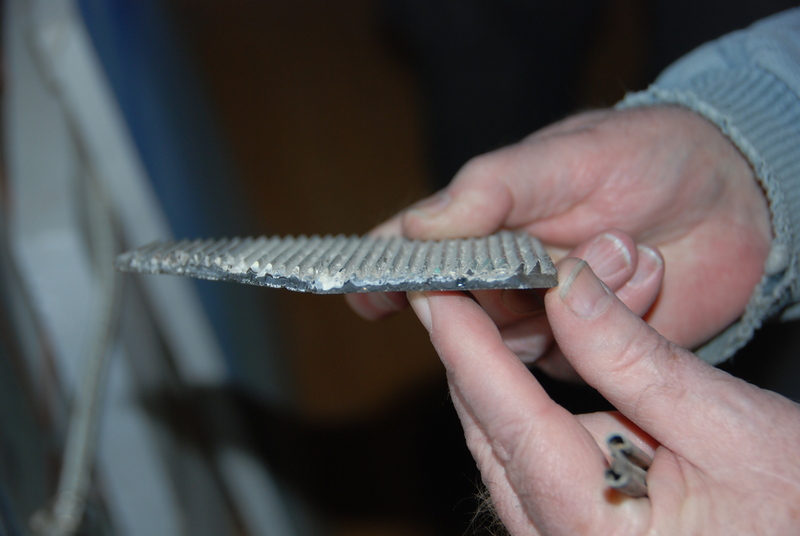 Modern science is pin-pointing the materials used in ancient weapons (Todd Kristensen). Archaeologists in N.W.T. have also found a snare in an alpine ice patch that was used to capture ground squirrels, the skins of which were stitched together to form beautiful robes. Based on First Nations traditional knowledge, up to 200 snares were set in a single alpine area and this could produce enough food to last for months. Add to this the supply of caribou, sheep, ptarmigan, and berries, and alpine life from late summer to early fall was good. 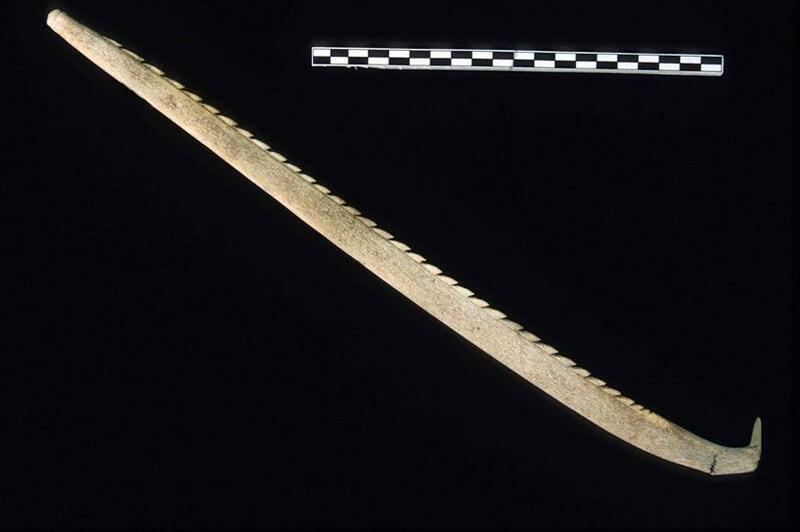 This barbed lance is a carved piece of antler from a Yukon ice patch (courtesy of the Government of Yukon). Ice patches that lasted for over four millennia have vanished in the last 50 years and scientists are monitoring the implications for alpine ecology. 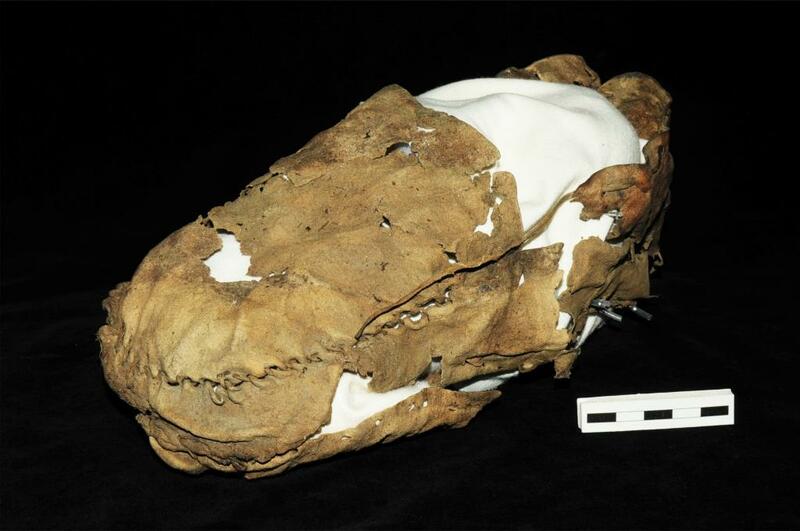 While the causes of ice retreat are debated, the impact on the archaeological record is clear. 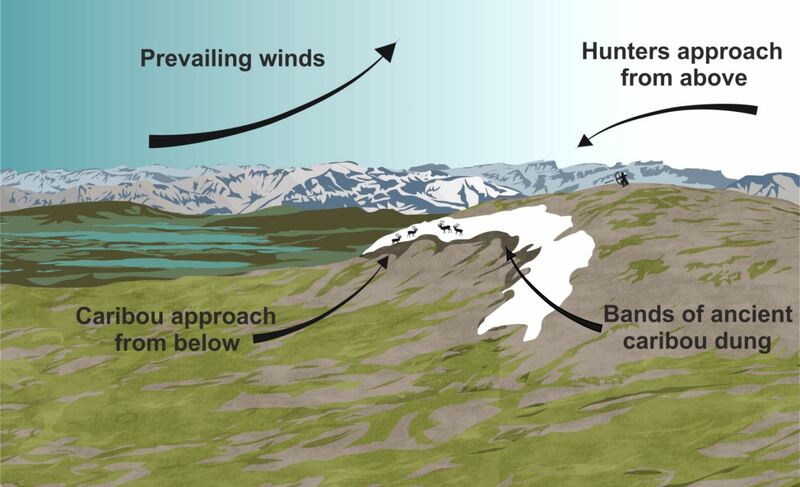 Melting ice has unlocked a story of prehistoric hunting but at the same time, it has exposed those very clues of the ancient past to destructive high altitude weather. A book is opening and quickly closing and much remains to be learned before the fragile alpine artifacts decompose. If modern climbers find old bones, wood, or a potential artifact, please leave them in place and contact the authors with some photographs or map coordinates so we can continue to learn about the deep past of life in the alpine. Ice patches in the North West Territories. (Tom Andrews, Government of N.W.T.). A full version of this article appeared in the October issue of Alberta Outdoorsmen. The new year is getting into full swing, and 2015 will see communities across Alberta conserving and celebrating their valued historic places. 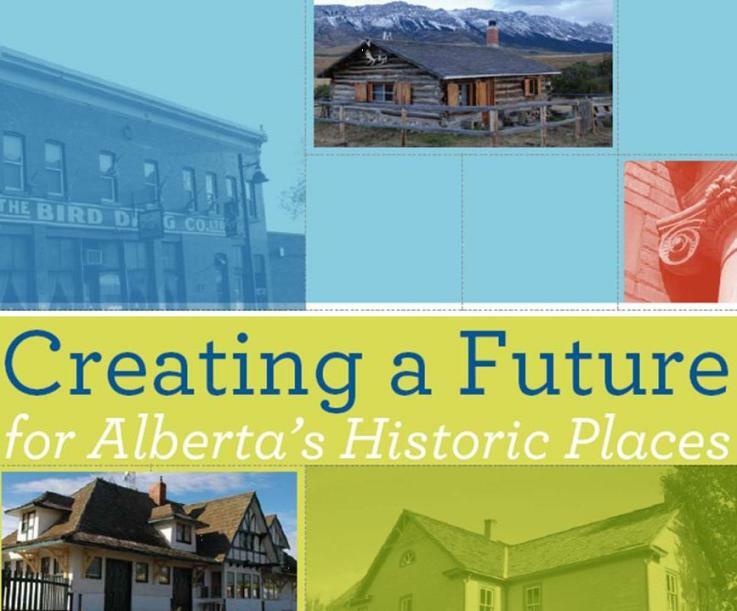 This past Fall, several local governments applied for Municipal Heritage Partnership Program (MHPP) Grants from the Alberta Historical Resources Foundation. At the Foundation Board’s November 29, 2014 meeting, five municipalities received funding for strategic heritage planning projects. These initiatives will help to create a meaningful future for key heritage resources. Municipal Heritage Partnership Program grants were awarded to five communities across Alberta. The City of Lethbridge is continuing its heritage planning work with a Phase III project to add information to its Heritage Inventory. This smaller project will evaluate approximately properties from the City’s “Places of Interest” List. Lethbridge received a matching grant of $5, 500 in MHPP funding. Over the past few years, the Municipality of the Crowsnest Pass has completed Phases I and II of their own Heritage Inventory, documenting and evaluating the communities of Coleman, Frank, and Blairmore. This year, they will be working on the former Village of Bellevue, Hillcrest Mines, Passburg, and the rural area to the eastern-most boundary of the municipality. For this comprehensive project, Crowsnest Pass received a matching grant of $30, 000 in MHPP funding. 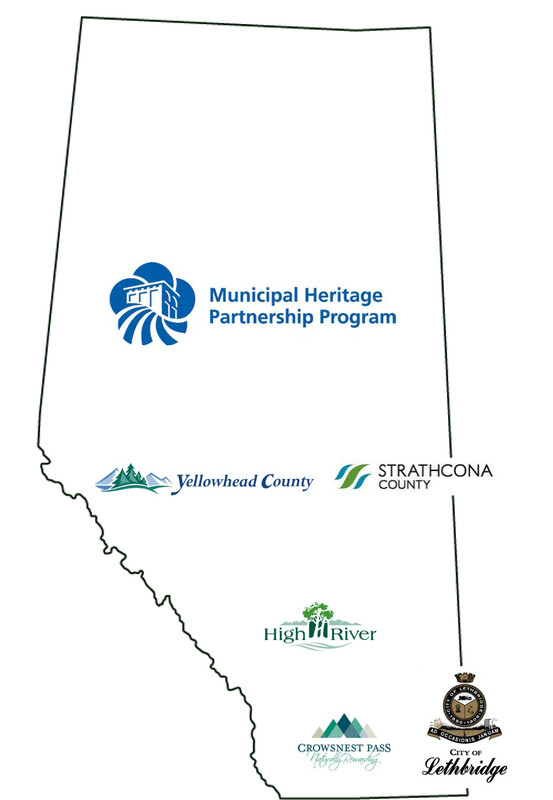 Moving up to central Alberta, Strathcona County has long partnered with the Municipal Heritage Partnership Program. They are continuing their Heritage Inventory work with a Phase III project evaluating additional properties from their Places of Interest List. Evaluating a smaller number of priority sites is a budget-friendly way for a municipality to continue its heritage planning work. Strathcona County received a matching grant of $6, 000 in MHPP funding. The Town of High River, valiantly soldiering on with its heritage work after the catastrophic floods of 2013, applied to continue with Phase III of their evaluation work as well. This Phase will supplement the previous projects, which laid a great foundation for the future. High River received a matching grant of $20, 000 in MHPP funding. Taking a jog out west, Yellowhead County is doing something different this time around. While the other grant recipients prioritized evaluation work, the County is preparing its first Heritage Management Plan. Having completed a few rounds of Heritage Survey and Inventory work already, the time has come to focus on policy and strategy. Yellowhead county received a matching grant of $20, 000 in MHPP funding. What these projects demonstrate is the increasing skill and capacity of local governments across Alberta to evaluate and manage their own, top-notch heritage programs. The increasing number of historic places being protected and conserved as Municpal Historic Resources is a testimony to the excellent work being done at the local level – all over Alberta. Congratulations!